Background: Approximately 3% of Tuberculosis (TB) patients have a venous thromboembolic events (VTE). The use of Vitamin K antagonists (VKAs), as anticoagulant, in patients receiving anti TB antimicrobials is often complicated by drug interactions, especially with rifampicin. These patients require frequent monitoring of the International Normalized Ratio (INR), and it is reported that warfarin can not achieve a therapeutic INR. In such cases, abruptly stopping the rifampicin once the course of anti TB antimicrobials is not completed is potentially hazardous. The most recent alternative to prevent thrombotic episodes by using oral agents is represented by novel oral anticoagulants (NOAs) an important breakthrough since they do not require strict laboratory monitoring, frequent dosing adjustments, or dietary restrictions; moreover, they and they are linked with far fewer drug-drug interactions. Objective: We have performed a Systematic Review to retrieve information about studies that have assessed the effect of NOAs administered in combination with anti TB antimicrobials in order to investigate if NOAs could be used in TB patients with VTE that do not achieve a therapeutic INR with VKAs. Method: The MEDLINE and Google Scholar databases were screened from the inception to 5th of February 2017, using two search strategies: the first one was antimicrobials AND novel oral anticoagulants; the second was antibiotics AND novel oral anticoagulants. Conclusion: No published data were found that properly assessed the effect of NOAs administered in combination with anti TB antimicrobials. Further studies are needed to establish the safety of NOAs in this clinical scenario. 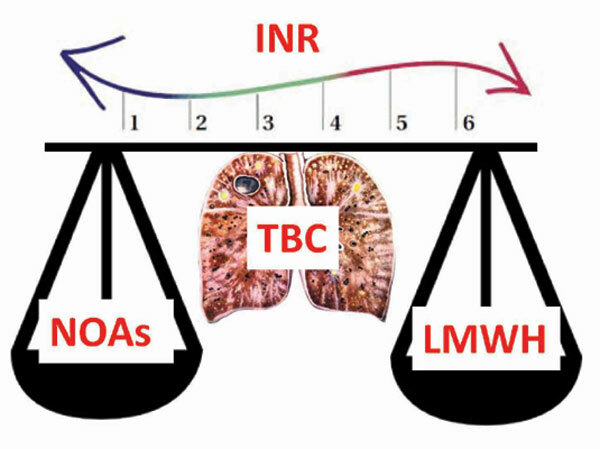 In the meanwhile, a viable alternative to VKAs, in order to prevent complications of VTE related to TB, may be represented by Low Molecular Weight Heparin (LMWH), notwithstanding the limitation of the parental route of administration. Keywords: Novel direct oral anticoagulants, antitubercular therapy, antimicrobials, tuberculosis, venous thromboembolic events, systematic review. Keywords:Novel direct oral anticoagulants, antitubercular therapy, antimicrobials, tuberculosis, venous thromboembolic events, systematic review. Abstract:Background: Approximately 3% of Tuberculosis (TB) patients have a venous thromboembolic events (VTE). The use of Vitamin K antagonists (VKAs), as anticoagulant, in patients receiving anti TB antimicrobials is often complicated by drug interactions, especially with rifampicin. These patients require frequent monitoring of the International Normalized Ratio (INR), and it is reported that warfarin can not achieve a therapeutic INR. In such cases, abruptly stopping the rifampicin once the course of anti TB antimicrobials is not completed is potentially hazardous. The most recent alternative to prevent thrombotic episodes by using oral agents is represented by novel oral anticoagulants (NOAs) an important breakthrough since they do not require strict laboratory monitoring, frequent dosing adjustments, or dietary restrictions; moreover, they and they are linked with far fewer drug-drug interactions.